Imagine if the question “What’s for dinner?” was easy. More importantly, what if it was made easier for YOUR family? Tried and tested in kitchens just like yours, we have recipes you can rely on. Recipes for families of all shapes and sizes. With 2500+ recipes and advanced search functionality, we cater for your family’s unique combinations of likes, dislikes, needs and wants. We take the guesswork out of what to cook and help you feed your family while making the most of your Thermomix. So much variety! There’s truly something for everyone in each issue, perfect for families of all shapes and sizes. Who has time for failures and flops? Each recipe tested in kitchens around the world to ensure they work first time, every time. We know you are on the go, so your recipes should be too! Use the website from any device that has internet connectivity, or download handy eBook versions to use when you are offline. More than just a magazine, our online community helps you make the most of your magazine AND your mixer. The most you will pay to add an issue to your library is $6.99! For 40+ tried and tested recipes no one can beat the value we offer. All the recipes you will ever need! Of all the new recipes I try The 4 Blades ones always get a good response from family and friends. We have a long list of family favourites now, and most of them are 4 Blades recipes. The 4 Blades are my go to recipes for meal planning, parties, kids snacks and literally everything Thermomix. I'm saving money, and wasting much less food, because I can now search for ingredients to cook with, search for how many serves I want it to make, and for how much time it will take to cook (plus so many other amazing search options). Love The 4Blades community. There are so many family friendly recipes that cater for all ways of eating - LCHF, allergy friendly and lots of others are all covered. The website allows to search by ingredient and to save favourites. Easy to search by category and ingredient, easy to use in my current menu planner app and can use on all platforms... laptop, iPhone and iPad! Absolutely fabulous recipes. The easy to use search function makes meal ideas a breeze. Diving into the gold of The 4 Blades turned my Thermomix into my best kitchen friend! 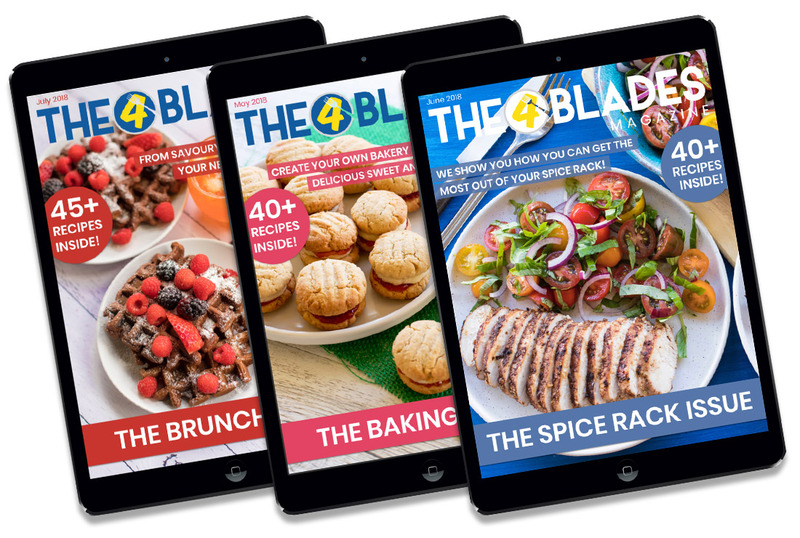 The 4 Blades is jam packed with delicious recipes for all kinds of dishes. Fantastic search function on the web page makes it a cinch to find a recipe on the fly.